The Seychelles authorities are taking actions to prevent further shark attacks by implementing the recommendations of the South African shark experts. According to the information site linfo.re, the first provisional shark (exclusion?) nets have been installed off the coast of Anse Lazio on September 05. The local authorities are also planning to import nets that are more appropriate for a long term use. The ban on swimming and diving remains in force at ‘high-risk areas’. 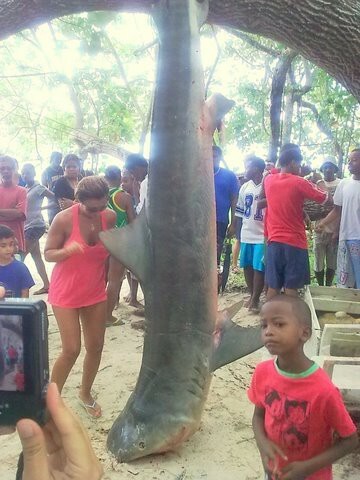 Meanwhile, the shark hunt is continuing along the coast of Praslin island. A statement by the government said the fishermen’s operation should ‘control the entry of large and dangerous sharks close to shore’. The authorities ask to report every capture to Mr. Rodney Quatre who is in charge of collecting all data on sharks. Linfo.re is also reporting that researchers are going to conduct a DNA test of a tiger shark, caught in late August (photo below). A shark tooth fragment found in the victim’s wound should be compared with the obtained DNA.